What Are We Eating, And Where? This cool series of maps at Daily Yonder shows consumption of various food and drinks across the U.S.
You might expect those two maps to be near mirror images - that in places where people eat more fruits and vegetables, they're eating less meat, and vice versa. 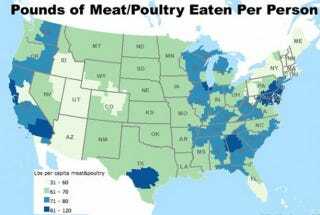 But notice that in fact, many places stand out as having particularly high consumption of both categories of food - for instance, the big dark splotches in Texas and Georgia show up on both maps, as does a large region in Pennsylvania, New Jersey, Maryland, and northern Virginia. Northern Colorado, and all of Arizona, on the other hand, rank in the lowest category for both meat and fruits/veggies. So for our Coloradan and Arizonan readers: what are y'all eating? Limited-service restaurants include establishments primarily engaged in providing food services (except snack and nonalcoholic beverage bars) where patrons generally order or select items and pay before eating. Food and drink may be consumed on premises, taken out, or delivered to the customer's location. Some establishments in this industry may provide these food services in combination with alcoholic beverage sale. And how much are we spending in those fast-food establishments? The maps are based on data from the USDA Economic Research Service's interactive food atlas, which provides a wealth of information on food availability, where Americans buy their food, physical activity levels, health indicators, and so on.